This reproduction of Mona Lisa’s face was created as a sample piece that could be used to show to prospective buyers. No photograph can truly capture the texture of the thread, the layering of colors, and the realization of the amount of time and attention to detail that goes into each work. One of the most difficult things about any artist’s work is finding ways to make contact with the public, so that anyone can appreciate it, and hopefully someone can make it their own. The internet is a wonderful resource for reaching a worldwide audience, but anyone interested in purchasing a work of art would definitely want to see it in person first. When the image can be chosen and the work commissioned specifically for the purchaser, then that becomes impossible. 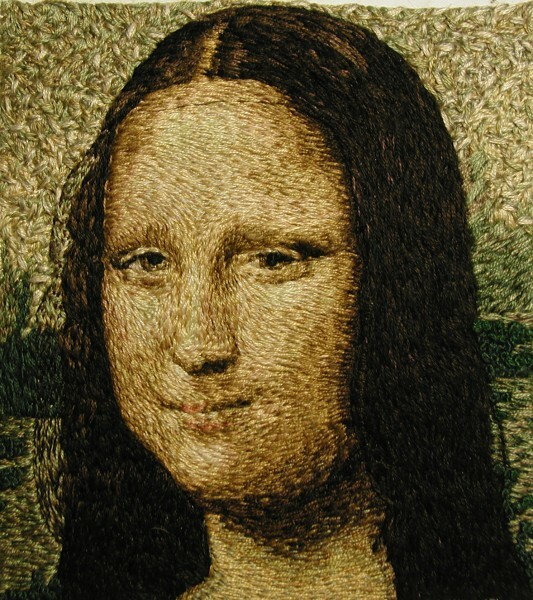 If you were considering commissioning an embroidery piece, the Mona Lisa could be sent to you anywhere in the world to give you an idea of the quality you can expect to see in the finished piece. I chose the Mona Lisa because I wanted to see if I could reproduce the effect of her famous smile by copying the detail as faithfully as possible. What I discovered, however, was totally unexpected. Despite years of studying art history in college, and seeing innumerable reproductions of this painting, I had never noticed or been informed that what makes her expression so mysterious is not her mouth, but the fact that she has no eyebrows! Dimensions: 5”x 4.5” = 22.5 sq. in.